Holland Sports Darts Teams play during the winter season in the Oxted & District Charity league. This year, the ‘A’ team finished the Super League as champions, finishing 2 points clear of The Greyhound in the play off. We also had Simon Istead finish as runner up in the singles, and Richard Knight & Simon Istead finishing as winners in the pairs. The Holland Sports B team finished a respectable 4th place in their league. 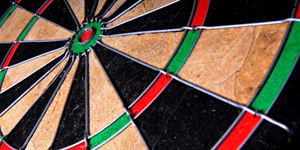 Currently we have one team playing in the Holland Sports Summer Charity Darts League, and also have a team playing in the Forest Row Winter League on Friday nights. All teams welcome new members and we have the facility to accommodate one new team on a Monday night, and two new teams on a Friday. Get in touch with us if you would like to join one of the teams, or just come to the club to chuck some arrows for a bit of fun! Both our dart boards have digital scorers, so don’t worry if you maths isn’t up to scratch, and house darts are available to borrow from behind the bar.